Emanuele staggers into the kitchen, pouring sweat. “You’ll never have to worry that I’ll murder you and hide your body in a pit in the garden” he gasps, as he swigs down a liter of water. Rather than a strange Sicilian declaration of love, this is a gardener’s realization that between wanting and having a garden there is a whole lot of backache. After various attempts at planting things that dry up within minutes under the intense Sicilian sun, we have settled on a drought-resistant creeping rosemary to be planted in a neglected section of the garden. We buy a dozen plants, and the next morning, I get up early to dig holes. It is mid-April, but the earth is already baked dry. It looks like something from a drought-stricken desert, but with more rocks. My first energetic lunge with the hoe knocks me off balance with the impact, and leaves a small dent in the earth and a much larger one on my self-image as a strong competent woman. Another whack with a hoe hits a rock, and I spend 10 minutes wrestling the thing out. By the time I have managed to dig one hole, I am breathing heavily and cursing, and by the third one, I’ve collected a bushel of rocks and crabgrass and am ready to break for lunch. What ever possessed us to buy 12 of these damn things? 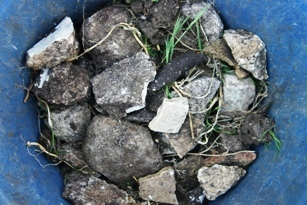 3 days of digging later, I have a crippling backache and barely enough strength to open the bottle of Ibuprofen. But the rosemary plants are in and watered. Fingers crossed that they grow! 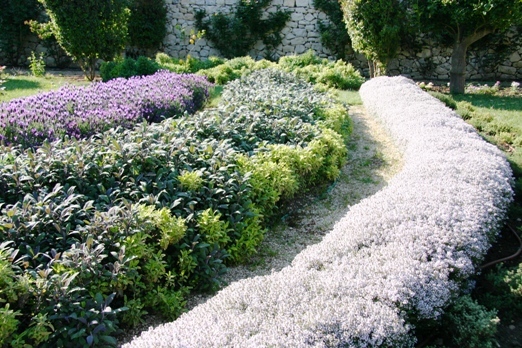 I ho bble over to the part of the garden that is thriving, and gain strength as I admire the lavender in bloom and the hedge of thyme in a spectacular moment of blooming perfection. 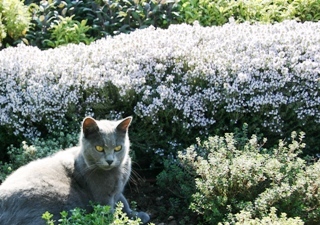 A cat joins me to relax amongst the thyme, taking all our work for granted. A garden is not made overnight, I remind myself – we made this beautiful space from a plot of weeds. Then I limp back to the kitchen for a glass of wine. Excellent post! Better you than me. In Florida, we have landscape guys who come to the house and do this stuff. @Joe – a proverb that is unfortunately oh-so-true!